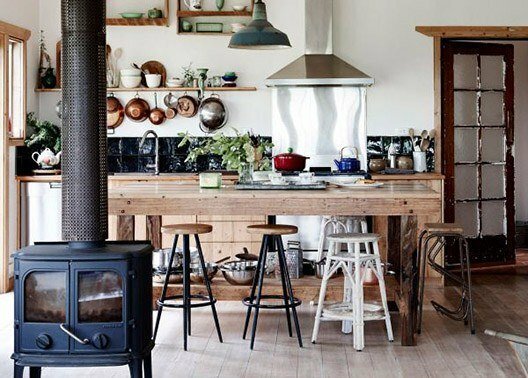 The Amazing AGA Cooker and Why You Should Get One Now! The AGA Cooker has become synonymous with traditional kitchens throughout the UK for nearly a century. Since its invention, the coal-burning AGA has evolved to accommodate modern fuel sources while still maintaining is practical and aesthetic capabilities. The AGA was invented in 1922 by blind Nobel Prize-winner and physicist, Gustaf Dalén. Dalen lost his sight in a failed experiment and being home-bound since the accident, he realised that his wife’s oven was impractical and inefficient. He set out to design a better range cooker and the first AGA Cooker’s were imported into Britain in the 1929. By the early 1930’s, they were being manufactured at the Heat Ltd factory in Smethwick, and by the 1940’s they were being produced in the Coalbrookdale foundry that is still their home today. What makes an AGA Cooker so unique? An AGA is a heat-storage range cooker. This means that the cooker uses a minimal amount of heat to maintain a constant temperature, which enables it to always be ready to cook while giving a gentle warmth to the kitchen. The heavy cast iron components absorb and store heat to be used when necessary. There are no switches or dials to an AGA, which means temperatures can only be adjusted in small increments through the thermostat. How is an AGA Cooker made? The steel components in the AGA Cooker or Stove are made by pouring molten iron into moulds, giving the elements their characteristic and unique surface. The exterior is meticulously enamelled over a 3-day period – a method that ensures the AGA will have an exceptionally long lifespan measuring decades. The many components are then thoroughly inspected and checked before the cooker is assembled in the new owner’s home. What are the components making up an AGA? One of the great hallmarks of the AGA, these insulated covers are slightly warm to the touch while maintaining a cook-ready temperature when opened. The boiling plate is spacious enough to accommodate 3 saucepans and can boil water in record time. Whether you choose electricity, propane gas, natural gas or oil as your heat source, the oven will only need a minimal amount of fuel to maintain its temperature once it has been heated up. With much lower temperatures than the boiling plate, the simmering plate is perfect for reducing sauces or when cooking egg dishes. Similar in size to the boiler plate, it can hold 3 saucepans. An oven big enough to accommodate a 13kg bird, it is spacious and suitable for everyday cooking, grilling and baking. Perfect for slow-cooking, the oven maintains the right heat for meat dishes over a longer period. This is an addition in a 3- or 4-oven AGA. The moderate temperature held by the cast-iron interior is perfect for baking anything from biscuits and cakes to bread. This is a standard with every 4-oven cooker and has the unique ability to keep food warm without drying. Also great for warming plates before serving. 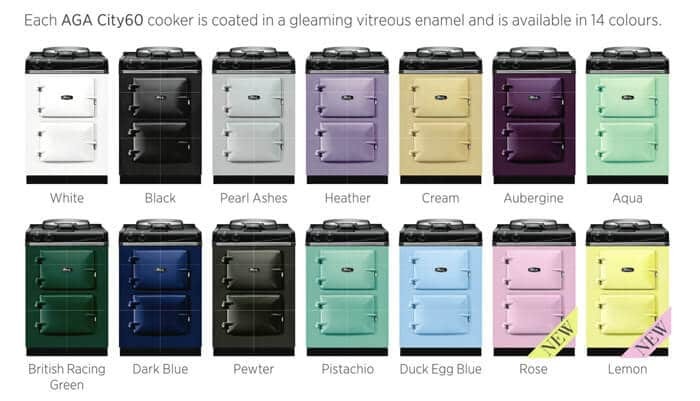 AGA cookers are available in up to 15 colours and 8 models, ranging from smaller 2-oven units to the 5-oven models with all the bells and whistles. For further flexibility, there are various heat source options as well: gas, electric, dual fuel and oil. Modern AGA’s have controls that allow the user to switch the hotplates on when in use, and off when not. Since the hotplates consume most of the energy, this has made a big difference in the energy consumption of the cooker. In 2004 the first 13-amp electric oven was introduced. This allowed the user to plug in their AGA at a standard wall plug. In 2007, AGA also introduced AIMS – AGA intelligent Management System. This is a power regulation system that allows the oven to be ready for cooking when needed, but to “sleep” when not in use and to switch off altogether when the owner is away. AIMS can be retro-fitted to any 13-amp electric AGA and is also available for a selection of gas models. For more information on the power usage of the various AGA models, click here. All images courtesy of AGA unless otherwise indicated.